This is a picture of Eleanor Grainger taken in 1942. She was an "Air Warden" attached to the Aircraft Detection Corps during WW2. She had a book of air craft profiles and one of the only telephones in the area and reported on any aircraft that flew over the area to a central comand post. Pilots in those days used Nadina Mountain as a navigational aid just they do today, it is such a prominent feature in the area. Francois Lake is fed at its west end by the Nadina River. The Nadina bridge is located at the head of the lake, 54 kms west of the Northbank ferry landing. 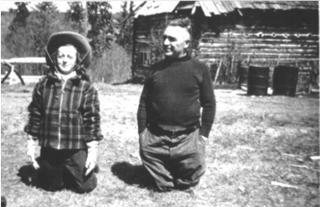 Laura Henson at age 15 with Joe Hendrix in the yard at the back of Gale's store at Nadina. 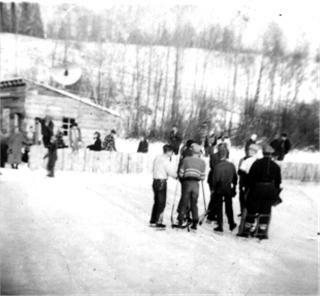 The log building in the back is Gale's store. Looking east towards Francois Lake. Looking west towards Nadina Mountain. 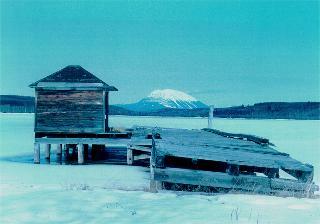 The old Government Wharf at Nadina. The Nadina River Bridge today. 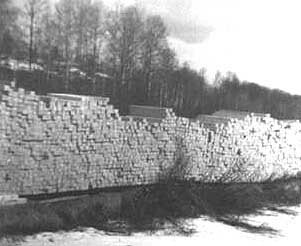 Railroad Ties stacked alongside Nadina River waiting for shipment down Francois Lake. 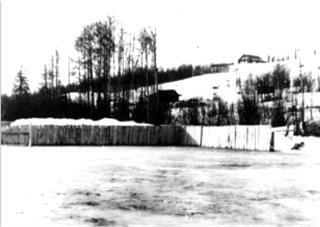 Picture taken in the spring of 1957. 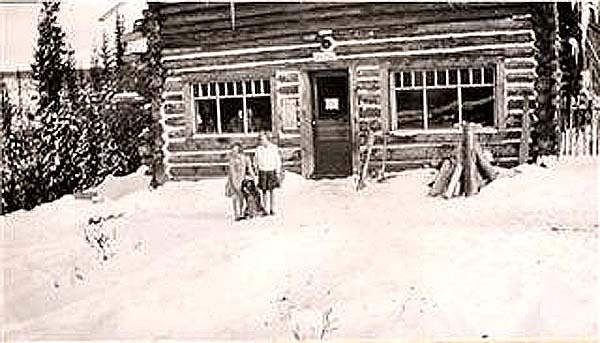 Nadina River Post Office: opened December 1, 1925 and closed August 9, 1940. Franklin Gale and Earl Osborne were the postmasters. 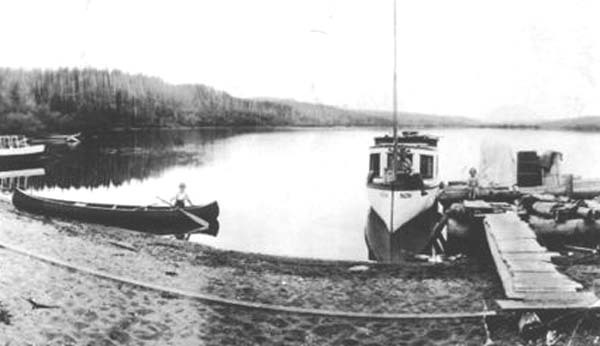 Frank Gale in canoe, Franklin Gale on bow, Elsie Gale on the wharf. 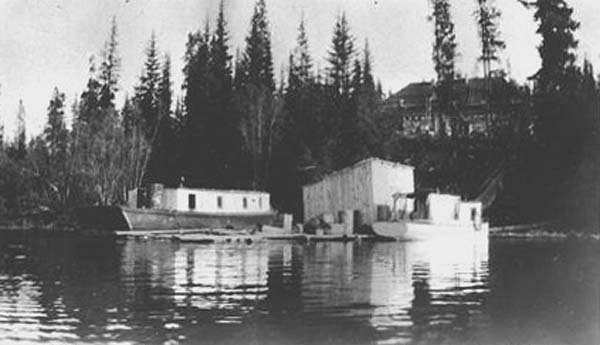 Boat named "Nadina" with Gale Store on hill in background. 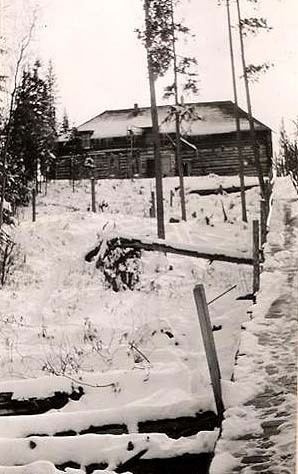 Gale General Store overlooking Francois Lake. Gale General Store at Nadina. 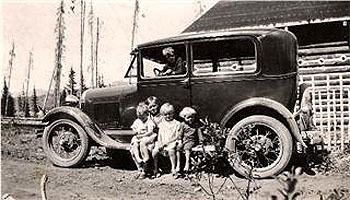 This photo says Joe Van Lear in Atakokan, Ontario 1911 ... apparently he was a family friend of the Gales. Van Lear Creek on the north shore near the west end of Francois Lake is named for him. 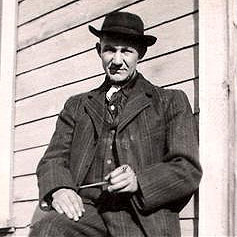 Neil Finch Gale, father of Frank, Roy and George Gale. 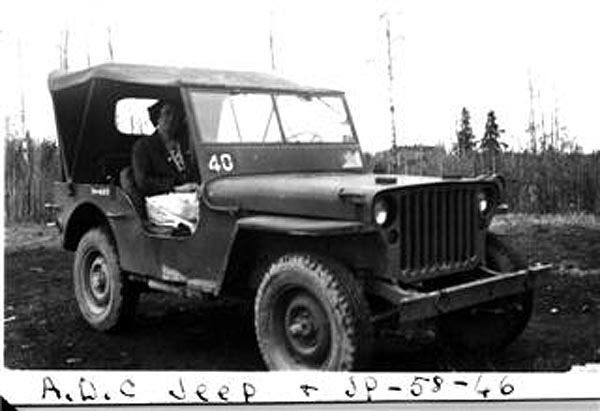 Gale Lake is named for him. He is buried in the Burns Lake Cemetery. He died in 1945. His wife's name was Elsie Van Bushkirk. 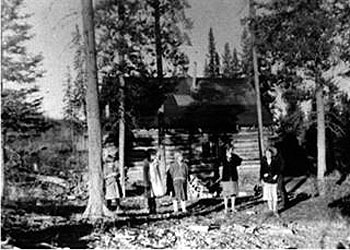 The family was associated with the settlement of Nadina River for three decades through the late 1920's the 1930's and the first half of the 1940's.